An early episode of “The Simpsons” exploited an ongoing public health crisis — asbestos in classrooms — for comedic effect in a school election. Bart leads the class to chant: “More asbestos! More asbestos! More asbestos!” He uses his rhetoric to become the school election favorite. Despite the humor, that pop culture reference offers a glimpse into America’s century-long complicated relationship with asbestos. Today, asbestos exposure is definitively linked to mesothelioma, which is a rare and incurable cancer that usually develops many years after the toxic mineral dust is inhaled. Thousands of Americans have lost their lives to mesothelioma cancer and other asbestos-related illnesses because of a lack of awareness about the dangers of asbestos and the negligence of some manufacturers who chose to not inform their workers about the hazards. But a series of references in comic books, movies, TV shows and video games shows asbestos is often used as a selling point or punch line. Well before the advent of television commercials, and even before the rise of radio advertising, asbestos was already established as a “miracle mineral,” useful in any product requiring strength, heat resistance and insulating properties. This Johns Manville print ad shows how asbestos-containing products were once seen as emerging technologies. Originally performed by Fred Astaire in the musical film “Roberta,” and later famously recorded by Frank Sinatra, one of the original versions of the jazz standard “I Won’t Dance” features the lyrics, “For heaven rest us, I’m not asbestos…I’m not gonna hold an armful of flame.” The “armful of flame” part was cut from later versions, but remarkably, the reference to asbestos survived. It may be hard to believe that Marvel Comics, the studio behind the popular “Avengers” movies, once based a supervillain on a cancer-causing construction material, but the truth is there in vibrant comic-book colors. Asbestos Lady provided a natural nemesis for the Human Torch to battle — though ultimately, in her last comic book appearance in 1990, the final blow came from mesothelioma. 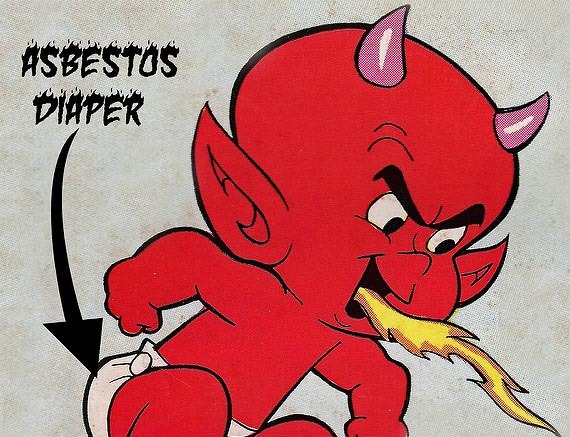 Harvey Comics is perhaps best known for the classic characters “Richie Rich” and “Casper the Ghost,” but among the publisher’s quirky cartoon lineup, you’ll also find a little red devil-child named Hot Stuff, whose diaper is made of asbestos. A clip from the classic series “Leave It to Beaver” shows an all-American dad explaining that men are more suited for cooking outdoors because they don’t need all the modern conveniences that women rely on in the kitchen. He then asks his son to pass him an asbestos glove. The 1960s studio audience laughed because an asbestos glove is a modern kitchen convenience, intended to keep its wearer safe. Marvel’s search for fireproof villains inevitably led them back to asbestos-based super-science. As with Asbestos Lady, the fate of Asbestos Man aptly summarizes the story of asbestos itself. Almost 50 years after debuting as a formidable adversary, Asbestos Man appeared one more time — as an elderly mesothelioma patient trying to rob a fast-food restaurant while breathing from an oxygen tank. The show’s lead actor, Gabe Kaplan, starred in a public service announcement about asbestos in schools. The 1970s marked a turning point in asbestos awareness. As victims of exposure began winning lawsuits across the country, asbestos became public enemy No. 1. “Welcome Back, Kotter” star Gabe Kaplan’s PSA about asbestos. From the 1980s onward, asbestos became a source of dark humor. In “National Lampoon’s Vacation,” Cousin Eddie tells the Griswolds he “got laid off when they closed that asbestos factory,” alluding to the catastrophic collapse of the American asbestos industry after the health risks of asbestos were exposed. In this “Rambo” parody, President Benson accidently swings into a fireplace and then emerges unscathed, explaining that his skin has been made of asbestos since a tanning-parlor accident. In the comedy “Step Brothers,” two men living off their parents go to great lengths to prevent their family home from being sold by masquerading as bad neighbors to pretending that one of them has died from asbestos exposure in the house. The preposterous situation points to the real-life effect asbestos-containing materials can have on a home’s desirability. Smash-hit video game “Fallout 4” allows players to extract asbestos from everyday objects and then use it to upgrade weapons and armor. To put this in context, the Fallout series is set in the irradiated ruins of cities destroyed by nuclear war, where exposure to basically everything causes cancer. As interesting as these references are, does pop culture take asbestos seriously? After all, many Americans are still dismissive of asbestos health concerns, and making jokes is not the way to change peoples’ minds. Since the first asbestos lawsuits, industry lobbyists have tried to write the issue off. President Donald Trump blamed asbestos regulations for the fall of the Twin Towers at the World Trade Center on 9/11. The scientific evidence, however, shows asbestos is toxic and asbestos-related diseases are preventable if people take the threat seriously. Employers and manufacturers are responsible for keeping workers and consumers safe from asbestos, and homeowners must leave it to professionals to identify and dispose of asbestos-containing materials. While there’s no harm in popular culture poking fun at serious topics, people need to remember that in the real world, asbestos is no laughing matter.